VEJA is a French born shoe company. VEJA has a vision that proposes cultural change and they pride themselves on making sneakers differently. VEJA offers a different vision which combines fair trade, ecology and links together economy, social initiatives and the environment. They use organic or recycled and fairly traded cotton for the canvas of the shoes and wild & fairly traded rubber for the soles. Recycled plastic bottles are also used to create technological fabrics. All products are made in a high standard factory in Brazil. 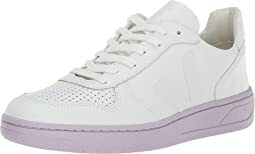 I brought these because I needed a light-colored sneaker for spring/summer, and I have gotten so many compliments on them! They are comfy, fit true to size, and didn't really need any breaking in. They are easy to dress up or down. I usually wear a 9.5 for flats, so I got the 10 to have room for socks. The white parts aren't blindingly bright, more of a soft white (which I prefer), and the holographic parts catch light nicely. The ankle support isn't as solid as some other sneakers, and there isn't a whole lot of padding on the bottom, but the insole can be switched out for something more supportive. It remains to be seen how well they wear/how long they last, but so far I am happy with the shoes and the price. Definitely one of the best fashion sneakers I own! Dear Veja: Please read some reviews and fix this widely reported problem! We LOVE your shoe styles and concept, but for the love, please modify the tongue of all of the sneakers. It is unbearably painful for most humans. This is the third style I've tried and couldn't even bear the pain of breaking-in phase. Also, sizing is pretty far off. I went a full size smaller, and could still go down another 1/2 size. So frustrating. Super cute and comfortable! They’re slightly large, but I’ll still keep them. tongue too long. digs into ankle. sent them back. These sneaks are cute, but unfortunately I found that they rub rather uncomfortably against the outside of my ankles. 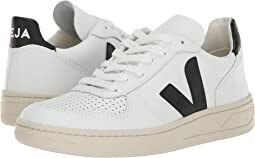 The veja v-12 is cut lower around the ankle and for me that style is much more comfortable. Got these shoes to replace some old white sneakers and they are great! Though a little pricier the brand is great and eco-friendly which I am willing to pay more for. The tongue irritated my ankle on the first few wears but not enough for a blister, now they are broken and super comfy. Love these. They do run large. I wear a 7 and ordered a size 6. Perfect! I loved these sneakers so much I went right back and ordered a second pair in a different color. They sell out very quickly. I would size down if you are in between sizes. They tend to run a little larg. Love the color and style of these sneakers. They run big so I ordered a whole size smaller (sz 5 instead of 6) and they fit perfectly. I found the sneakers stiff initially but after wearing for two days they are super comfy and cute. I get compliments every time I wear them! The fact they use up cycled materials and workers are paid fairly while making the sneakers is an added bonus. I will definitely be buying a white pair for the summer. Like many other reviewers have mentioned, the tongue on these shoes is incredibly uncomfortable. It's too long and digs into your ankle. That was an absolute dealbreaker for me. I love the look and sustainability of these shoes. However, they took a bit to break in and after they started to feel comfortable, they felt a little loose. That being said, I would buy them again! These shoes look absolutely amazing! The leather is super smooth to the touch, but yes, they are a little stiff as others have mentioned. They are more comfortable than I expected after reading other reviews, but I've only worn them a few times so far and expect them to get better as they break in. My heal does slip just a little, but not enough for me to rate them as "too big". I wear an 11.5 mens, and ordered these in a European 45 (and think a 44 would have been a little small). I plan to wear no-show socks with them, so I don't expect them to rub. The white is extremely white, so be prepared! Overall, VERY happy with the purchase! Very cute but very uncomfortable. There is no support. Felt like walking on cardboard. Way too big and leather is hard. I wish it worked out! I really wanted to love these shoes. Super cute and stylish. But soooo uncomfortable. The tongue was weird. Extra long and stiff. It jabbed so much into my legs the few minutes I had them on try them and walk around in them they made a painful mark. Sadly they had to go back. That tongue really needs to be shortened. These are more orthopedic-looking than I expected. They also run really large, so though I was super-excited to get these, they were a let-down in person. Such a bummer! I’ve been looking at buying these sneakers for quite some time, so I was happy to see them on Zappos! I originally bought these in my regular size 7 but once I got them them I realized the other reviews were spot on by saying they run very big. Thanks to Zappos great return policy I returned the 7 and got the size 6 really quickly. The size 6 fit perfectly! They definitely will take some time to break in because the leather is pretty stiff but they look great and will be worth it. If one Veja colorway or material is uncomfortable - try the same style in another material. Worth the effort! Pulled these in the “Multicolor burgundy lilas pixel” and the “Gold leather”. As I’d hoped, the gold metallic leather is softer than Veja’s usual stiff white leather. Ditto the mix of suede and mesh. Agree with someone who said go with your Euro and UK sizing if you know them for this brand. US, I’m properly a 9.5C (Euro 40) but I’d run between a 9.5B and a 10.5D in this type of shoe. Here the 10B (Euro 41) fit fine. Could stand a tad more width at front but this is doable. They don’t make a 41.5. (At N******** a size 42 in a leather+mesh Veja fit beyond huge on me. I have some 10.5 track shoes. US sizes 10 and 11 sound close, right? Unh unh. Too Big... in the way that you take a step and your whole foot comes out of the shoe. A tightly laced-up running shoe. While wearing thick running socks. So, half a US size down for me.) The Burgundy creased in one funny spot when I walked. Someone with a different foot will delight in their harmoniously crazy loveliness. This was my fave colorway of all, so Boo for me. The Gold looked cute online but I figured I’d prefer the Fitflop Rally in Platino in my “gold shoe taste test”. Nope. The V-10 in Gold leather wins by a landslide. Looks AND comfort. A few minutes of walking back and forth and the Veja hard rubber sole is already conforming and feeling cushier. And the arch support is minimal but not nonexistent. Does a shiny, shiny gold sneaker read like some futuristic granny cruising the moon’s first mall? Maybe?... But in the best and dopest way possible. Like, for real I love them. Look for the blinding glow of my gold, happy feet. You can't fault the looks of the Veja V-12 Velcro three-lock sneakers. 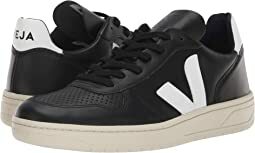 (FYI, the Veja 3-Lock Esplar versions are Fire! Even better! IFF you can wear a low, shallow toe box. It's shorter than Stan Smiths.) This V-12 pair is crazy cute in person. But the fit is just off for me. My foot runs to wide due to a bunionette (Taylor's bunion = other side of foot from a regular bunion). My podiatrist blames years of dance and too many very high heeled shoes.... I usually end up anywhere from a 9.5W (dressy) to a 10.5WW (running shoes) size in Women's parlance. That's a 40 to 41 in Euro, and a 7.5 to 8 UK. Here the Women's 10 B (Euro 41) fit okay - even a bit long - except the very tip top of the toe box seemed tight. (I have tried on other Vejas in the next Size 42 and they look like clown shoes on me - just far, FAR too big.) This leather is super thick and will probably last years. But it is SO stiff at first that I'd rather not risk the pain of the break-in. I don't think I'd know if these were workable for me for ages. If these came in a 41.5 = 10.5B or a 10C that might work for me. But they don't. The Extra White/Dried Petal smooth leather is the stiffest, while the Dried-Pedal Venus suede is heavy for suede but much more malleable than the smooth. If you have a normal to narrow width foot, these may be your jam. In that case if you are a half-size I'd choose DOWN a half. Wide-ish I'd choose UP a half size. Beaucoup points for style! And a great, sustainable brand. Veja is still all the rage in Europe. The shoes run large. I ordered a whole size down (37/6) from my normal size (usually between 7-7.5) and the fit was perfect. I was a little concerned from reading reviews that complained about how stiff and uncomfortable the shoes were, but I’ve broken in the shoes only after a few wears. I used to get blisters on my heels from Adidas grand courts but didn’t experience that with these. Just wear longer socks for the first week or so in these. I love the style of these and thrilled with my purchase! 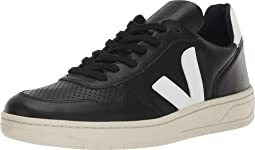 I have been looking to get a pair of Veja shoes for a while, but it is hard to find vegan ones in my size & color. I like that they are made of recycled plastic bottles, and organic cotton. They are a bit pricey for shoes that are similar to chucks, but Veja's transparency, organic materials, and fair trade sourcing are worth it. I've had them for a few weeks, and they are holding up well. They are comfy, and nice quality. I highly recommend them.